"The performance is lousy and there's nothing new," and other choice quips. 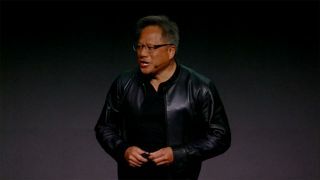 Nvidia CEO Jensen Huang isn't known for pulling punches, and in a roundtable interview with PCWorld and other outlets he let us know what he thinks about AMD's upcoming Radeon VII. In a word, he says it's "underwhelming." None of this is out of the norm for Huang, of course. He routinely speaks his mind and typically isn't in the habit of praising competitors. He goes on to elaborate that "the performance is lousy and there's nothing new… [There's] no ray tracing, no AI. It's 7nm with HBM memory that barely keeps up with a 2080. And if we turn on DLSS we'll crush it. And if we turn on ray tracing we'll crush it." Those last two are pretty much a given. Rendering a game at half the pixel count and upscaling via DLSS certainly boosts performance—by about 30 percent in Final Fantasy 15 according to our own tests using the RTX 2060. Ray tracing isn't even really a factor, considering no other GPUs besides the RTX line can even enable the feature right now. I wouldn't expect that to change either, as emulating ray tracing via compute instructions is 5-10 times slower than using RT hardware. But perhaps Huang does have a point on performance. We mentioned this earlier today when looking at the additional benchmark results AMD published for the Radeon VII. With 25 games tested on both the RX Vega 64 and Radeon VII, on average the Radeon VII is 28 percent faster—and we'll be generous and round that up to 30. Keep in mind that this is at 4k 'max/ultra' settings as well, which are more likely to stress the VRAM bandwidth. That makes sense, as AMD would want to paint things in the best light possible. For comparison, in our most recent testing for the RTX 2060 review, across 17 games the RTX 2080 averages 59.1 fps (46.9 fps minimums) at 4k ultra, while the RX Vega 64 gets 41.0 fps (33.1 fps minimums) using the same settings. That means we have the RTX 2080 outpacing the RX Vega 64 by 45 percent on average—and 43 percent at 1440p ultra, dipping to 36 percent at 1080p ultra. In short, any suggestion that the Radeon VII will consistently match the RTX 2080 is probably misleading and cherry picking benchmarks where AMD hardware does best vs. Nvidia's hardware. When reporters asked AMD CEO Lisa Su about Jensen's comments, Su responded, "What I would say is that we're very excited about Radeon VII, and I would probably suggest that he hasn't seen it yet." So I guess we'll have to wait a few more weeks to see how things shake out with final hardware and drivers, and independent performance testing. For now, here's our pick of the best graphics cards. It wasn't just the Radeon VII drawing flak from Nvidia, however. With its upcoming support for G-Sync on FreeSync displays, Nvidia makes the bold statement that FreeSync doesn't work. It tested over 400 FreeSync monitors and says only 12 work well enough that it will automatically enable G-Sync with them in an upcoming driver. I can certainly agree that some FreeSync displays perform less than optimally (eg, those with a limited 48-75Hz VRR), but I do question whether it's 12 monitors that fully work within the adaptive sync specifications, or 12 monitors that work with Nvidia's implementation of adaptive sync. The latter seems far more likely, and that number may improve over time as Nvidia tunes its drivers for the technology. It's certainly something I want to look at—using both AMD and Nvidia GPUs—when the feature becomes available.